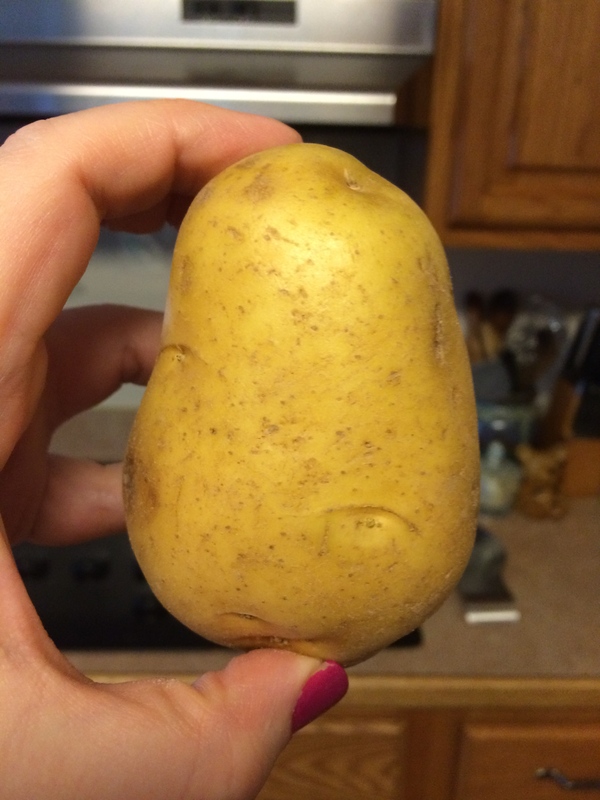 Yes, this is a picture of a potato. No, this hasn’t turned into a cooking blog. You wouldn’t want to take my advice in cooking anyway. Keep reading to find out how potatoes play an important part in this week’s DIY. 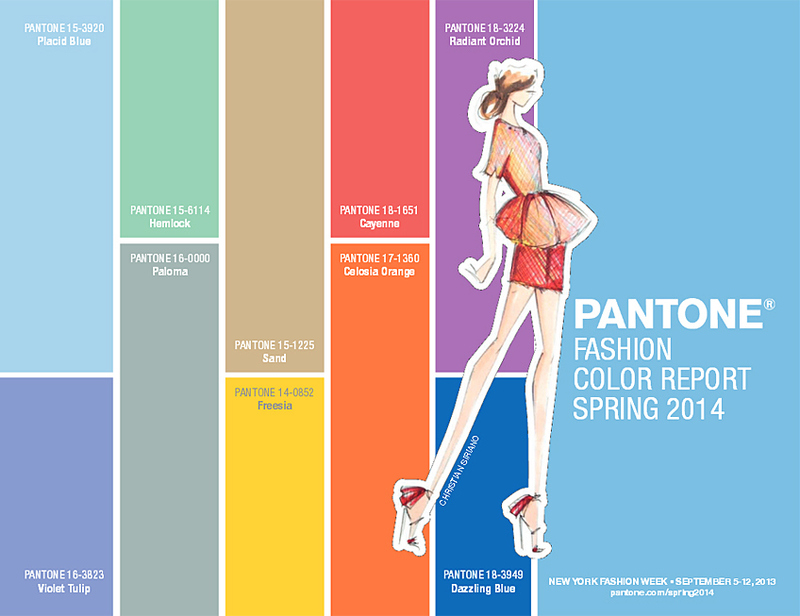 These are Pantone’s hottest colors for spring. 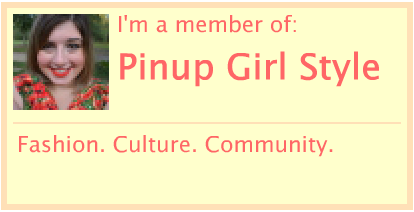 (The pin I found links to here.) Just who are these Pantone people? They’re the go-to people for standardizing colors, especially in the printing industry. Here’s some more info about them on Wikipedia. Fashion folks follow Pantone, too. Pantone declares a hot color for every year, and this year’s hot hue is the Radiant Orchid shade seen in the above picture, and I’m also a fan of 2013’s color, Emerald. As you can see in the spring palette, there’s a good mix of neutrals, brights, and pastels. In this week’s Style Study, I decided to put together three outfits using these spring colors (or as close as I could get). Unfortunately most of the pieces are from years past, so I could only provide direct links to a few of them. 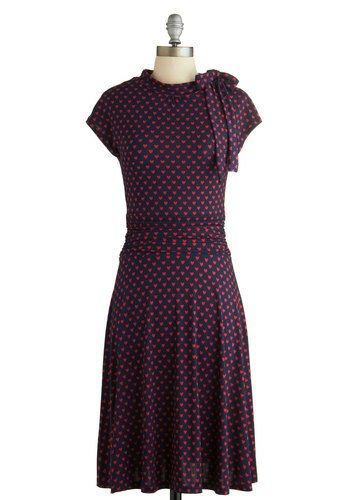 The good news is you probably already have some of these colors in your closet, too. 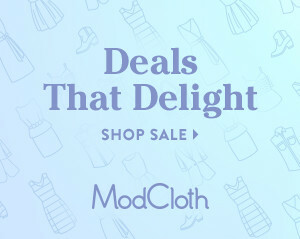 In the first look, I was super stoked to find that I had this maxi skirt from Cato Fashions with three of the spring colors on it: cayenne, sand, and hemlock. 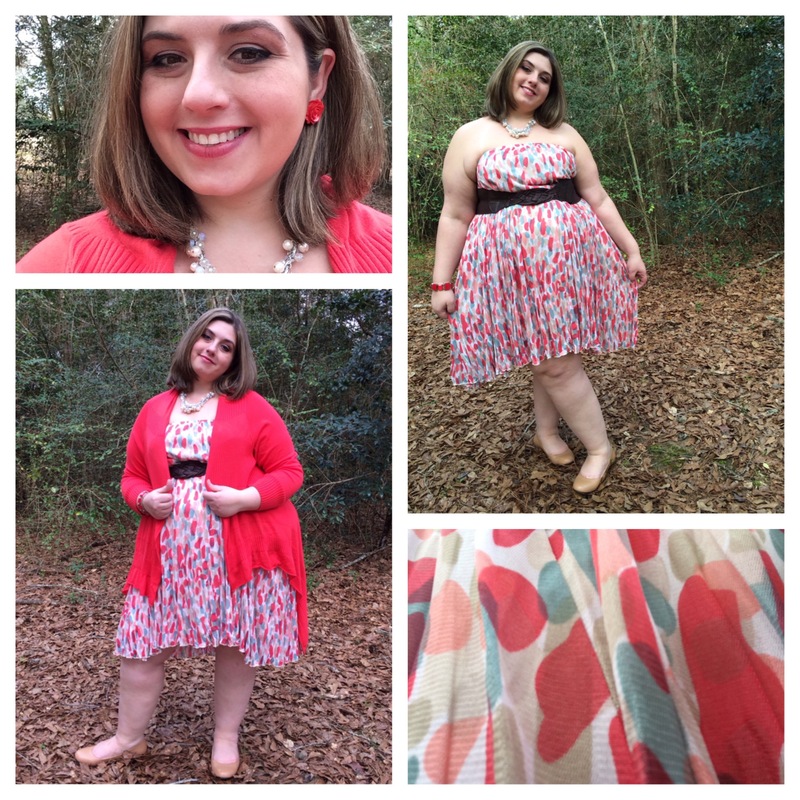 I pulled up the top of the skirt and used this belt from Torrid to make an instant dress. 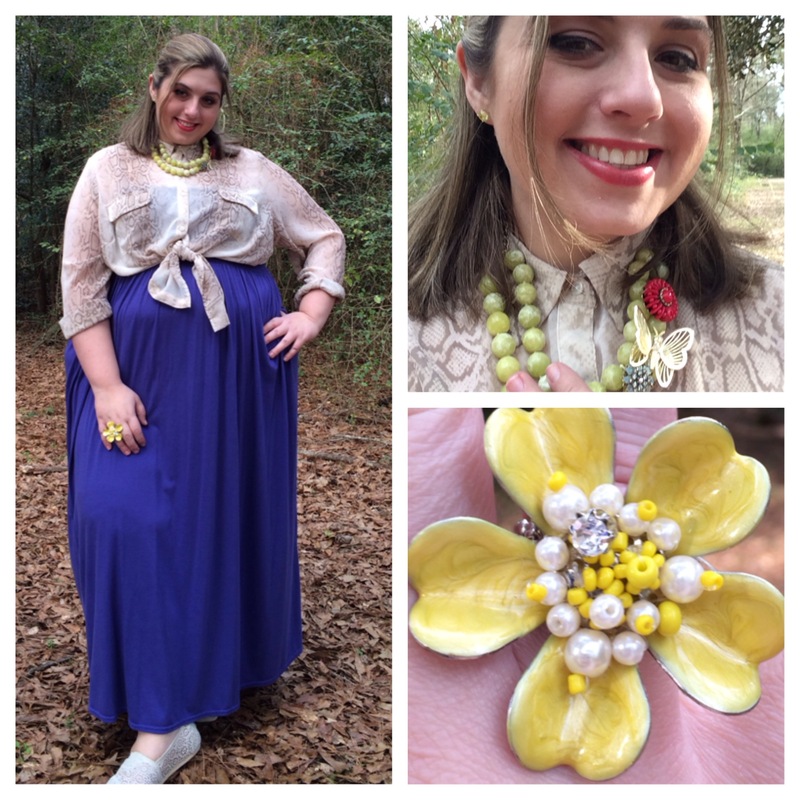 I played up the cayenne shade with the cardigan from Old Navy, the bracelet also from Cato, and the earrings from Charming Charlie. 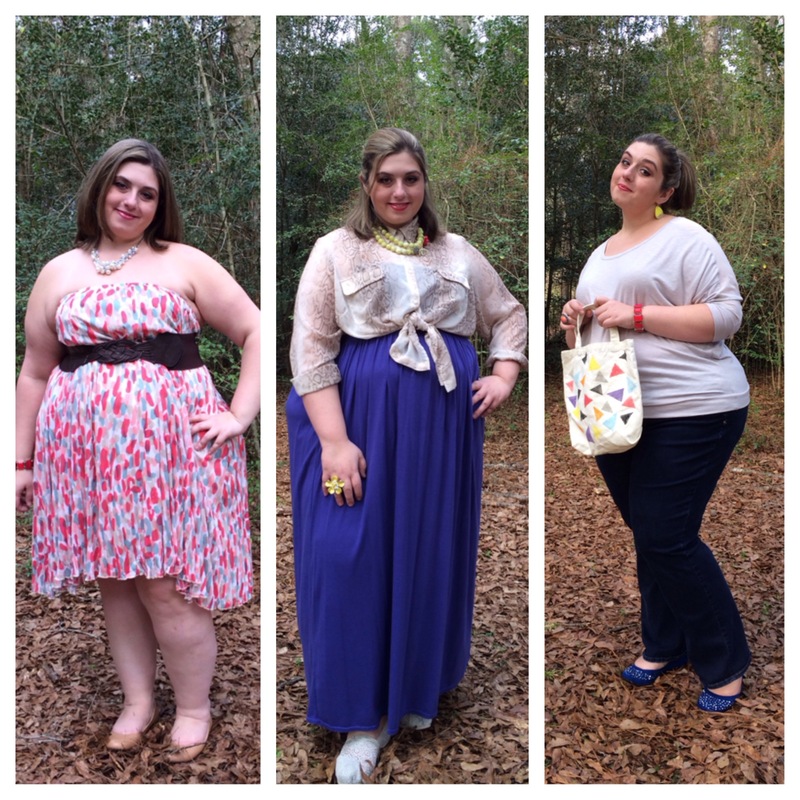 The pearl necklace is from Charming Charlie as well and the flats are from Zappos. Since purples are prominent in this group of colors, I used a purple tube dress from Ross as a foundation for the second outfit. On top of it, I tied this blouse from Old Navy in a sand snake print. I added some accessories in freesia, hemlock, cayenne, and placid blue (The ring is from Lane Bryant, the earrings are from Target, and the necklace is from Fossil). I finished the outfit with some beige shoes from TOMS. In the final outfit, I went for a casual look. 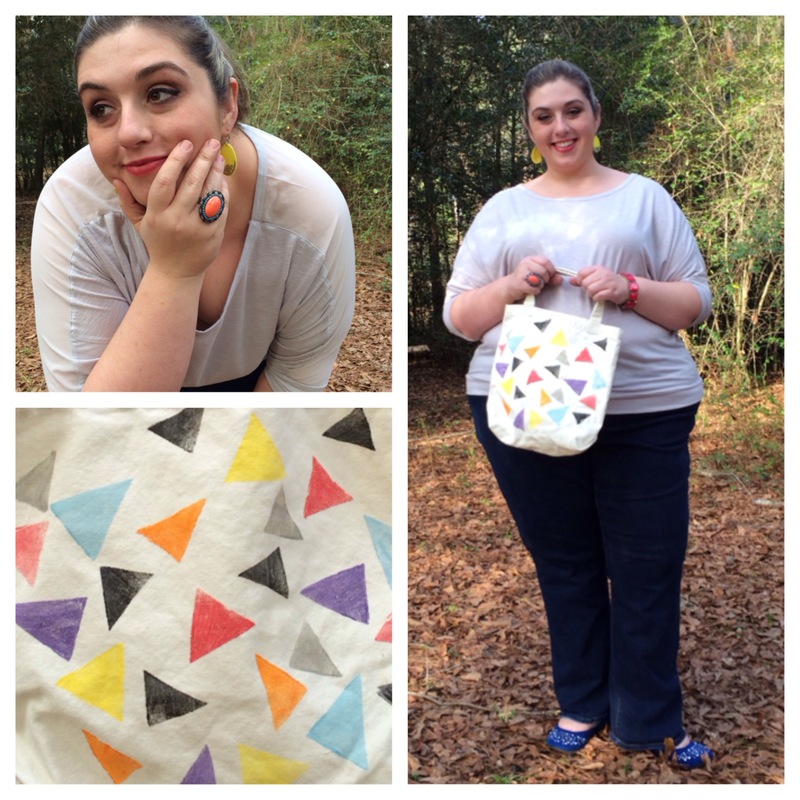 Dark rinse denim goes with any color palette, as do these straight-leg jeans from Lane Bryant. The top in paloma is also from LB. The dazzling blue shoes from Avenue dazzle a bit more with the studs near the toes. As for the accessories, the freesia earrings are from Charming Charlie, the celosia orange ring I believe is from Torrid (but I got it some time ago), and I used the same cayenne bracelet from Cato. 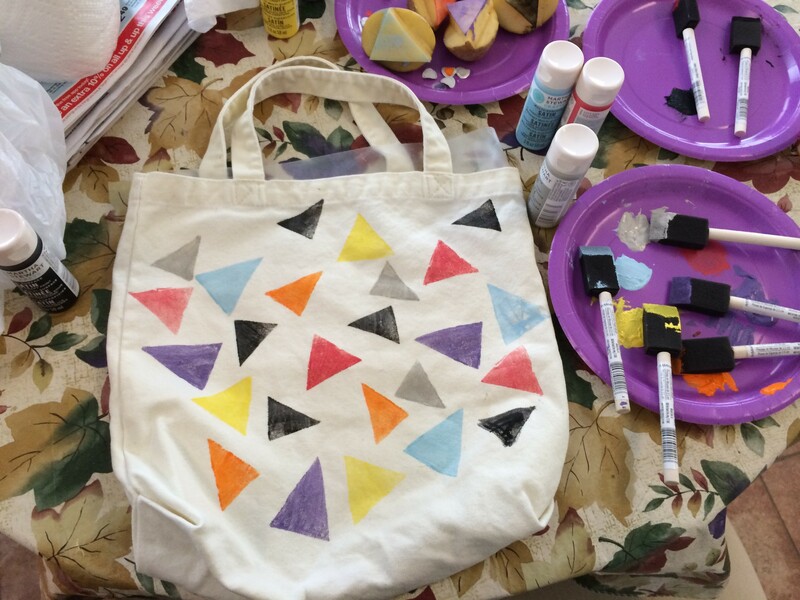 The triangle tote brings us to our friend, the potato, and to our DIY. Potatoes can be used for art projects! Who knew? Cut them up, and they make great stamps. I found this tutorial on Pinterest, and it was extremely helpful. 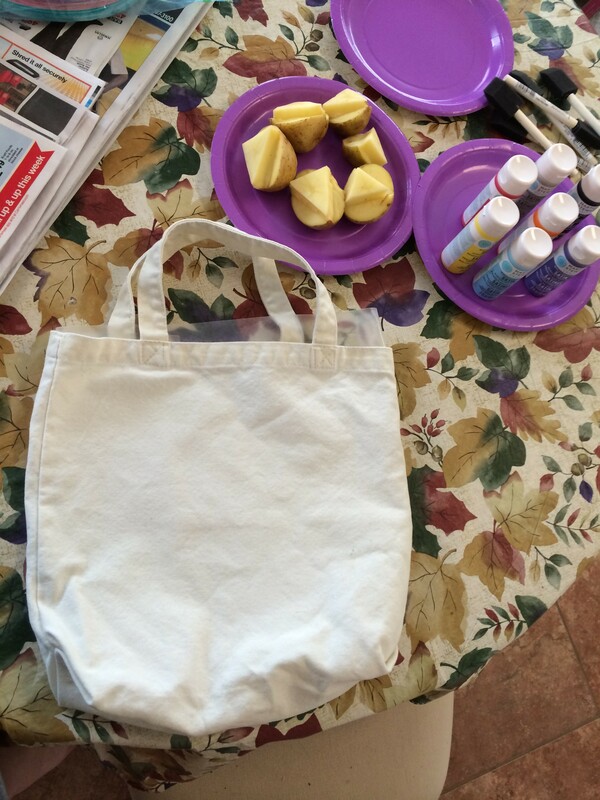 I got the blank canvas tote from Michaels. 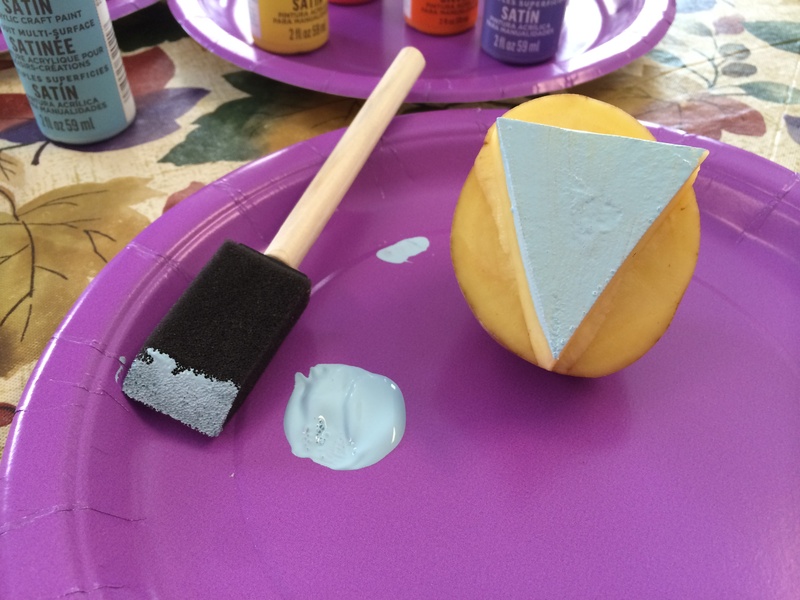 When working with potato stamps, use simple shapes—for example: triangles, hearts, squares, and crosses. Anything too detailed will look too blurry. 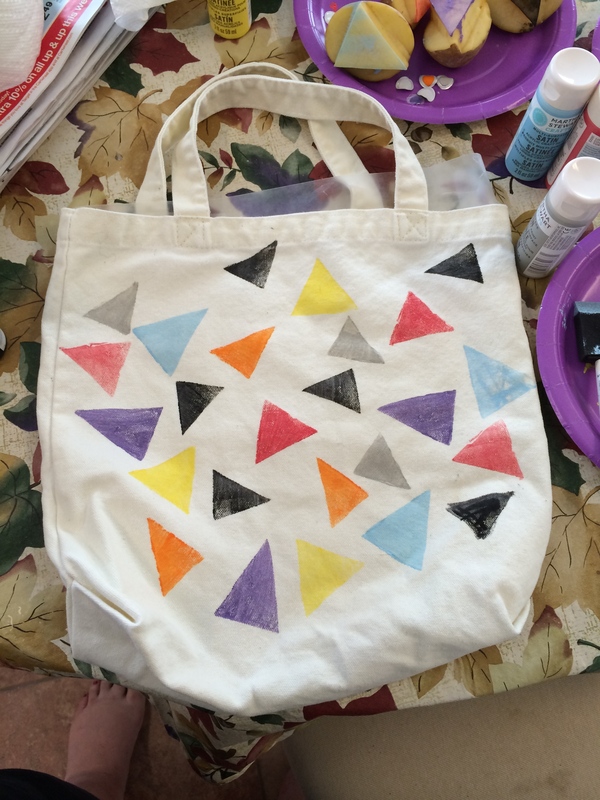 Put a sheet of wax paper flat inside of the tote so that the paint doesn’t bleed through to the other side. Also, I chose to apply the paint to the potatoes with a foam brush as opposed to dipping the stamps directly in the paint. I felt that it made the edges crisper (and we all love crispy potatoes!). When stamping on fabric, remember that not all acrylic paints will survive in the washing machine without adding a textile medium. You can usually find them by the paints at the craft store. Luckily, I used Martha Stewart’s satin paints (also from Michaels) that are made for a variety of surfaces, including fabric. The colors I picked were purple yam, blue sky, wet cement, marmalade, love bird, and chamomile. I also used beetle black to make the other colors pop. It really is as simple as it looks. Let it dry, and you’re ready to go! I had so much fun putting these outfits together. The Pantone colors encouraged me to take some chances pairing pieces that I never imagined would go together. Now, go do it! 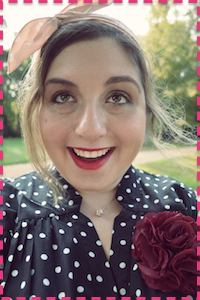 Raid your own closet, and mix it up! Love the boho flair in the second one.